Tyre sealant may just save race day by stopping punctures instantly and may just turn any bicycle tyre tubeless, but why aren’t more of us ‘roadies’ using it? We preview Fenwick’s Airtight. Rob Allen recently reviewed the Clement PDX cyclo-cross clincher. He was very surprised by the performance of the tyre, and used it instead of his usual tubs in his most recent ‘cross race. However, good though they were, he believes that if he could make them tubeless, they would be a game changer, eclipsing even his best tubular tyres. 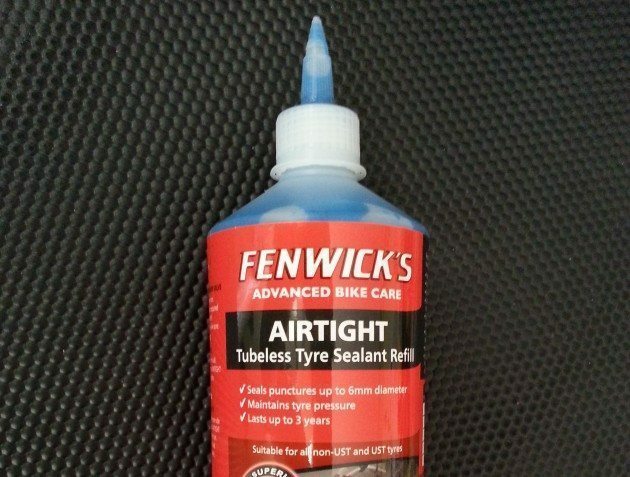 So we got in touch with Zyro, importers of Fenwicks, whose Airtight sealant may just be able to turn a normal clincher tyre, on a normal clincher rim, into a tubeless set-up… well Big Rob aims to find out exactly that when he reviews this tyre sealant. But this got us thinking, if this type of sealant is that effective, why aren’t more of us using tyre sealant in our race tyres? Think about it. Many of you reading this will be familiar with this depressing scenario. It starts well. You devote your week to training, gradually tapering down towards the weekend and your big race. You eat properly, maybe even carbo-loading to ensure your muscles are flush with that all important glycogen. You then kiss your other half goodbye at some ridiculous hour on Sunday, climbing into the car to travel for a couple of hours to your race. It is the worst feeling for an amateur rider having given up your leisure time. You feel totally drained, utterly disappointed but also guilty, as you’ve lost a whole morning for nothing. You could have spent it with the kids or gone for that spin with your mates. Instead if there’s no support vehicle, it can often mean a long walk, run or hitching a lift back to the HQ. Not fun. So, accepting that we all know how this feels, why then are we not all using tyre sealant? A good friend of CTR who still races at Elite level, rides to the local crit every week with his tubular wheels on his back. One week last summer, he had a bit of a bad back so, rather than risk any ‘loss of speed’, he decided to ride out to the race on his tubs. Surprise, surprise he punctured. Panic ensued as he tried to borrow a spare wheel! So again we ask why then are we not all using tyre sealant? So what are rider’s excuses? 1) The pros don’t use it – true but pros are very well supported with team cars burgeoning with spare wheels. Some amateur races do have support vehicles and if you are on good form you can get back on, if you can get a quick change and a decent wheel. 2) It increases weight in the most critical, rotating area – true but its only 20 or 30g increase which is not a great deal. We actually think that we would accept that in return for the peace of mind that the sealant provides. 4) Its difficult to insert into Presta valves – yes though not if they have a removable valve core. 5) Its messy and a pain – well it can be but the newer systems make injecting it fairly easy, without mess and it may be another thing on the to-do-list, but if it keeps you racing come Sunday, then surely its worth it? We are keen to put Fenwick’s Airtight to the test in a variety of set ups – tubular, normal tyre and tube, and tubeless – over the next few months, but if you are using it we’d like to hear from you about your experiences. Let’s see what Big Rob and the rest of us think when we start using Fenwicks Airtight, but just recalling the race scenarios described above is enough to make us wonder: why aren’t we all using sealant in our tyres? So how is running normal clinchers as tubeless going? well we’re still in the testing phase at the moment and will let you know. Any news? Just asking as I’m about to take the pluge and get some Bontrager tubeless wheelset and curious to know what kinda sealant to use. Andrew, we have an article in the back-end of the site on Fenwicks Airtight and going tubeless which should go live soon. Needless to say it works.